I think this is 2 in my overall..with the way I halfhazardly number its hard to tell. This was just a general using many different techniques and looking to see what came out of it. The top middle was my first try at the lionhead (yes the one marked fail). Topright was number 2...and sorta used a template I found..topleft was number 3..I followed it more closely (kinna realizin more what my problem was). Then I went bottom left, middle, and right. Bottom left and middle both were drawn while staring at an actual lion picture..the bottom right was me tryin to do one relatively freehand..to see what came out. The bottom row is..in my opinion much better. What's real funny though..due to how this is done..they look nothing at all like a lion until I actually put in the mane..but once its in..well it becomes so obvious..you'd wonder how you would midd them being Lions. It's a touch..odd....but it works so eh. 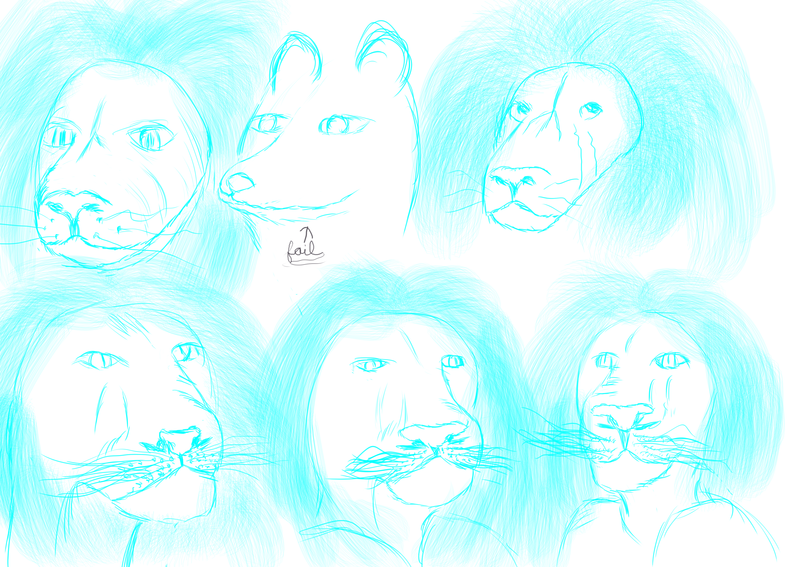 I should prob look up some lionesses and do some practice with that soon...for a difference type thing.